Sticky Balls is a puzzle game that's exclusive to the Gizmondo. The premise is basically pool meets Magical Drop (1995, Arcades), and the objective is to create clusters of similarly coloured balls in order to remove them from the playfield; once they make contact, they're permanently stuck together and care must be taken to avoid directly hitting the wrong coloured ball first, as your bonus value will reset to zero. There's 19 themed tables, as well as 12 bonus tables that can be unlocked. The gameplay is a hypnotically relaxing experience, and it's helped by the fact that there's no time limit. What I enjoy most is that there's numerous ways to beat each level depending on how adventurous (or brave!) you're feeling; sure, you can methodically work your way around the table sticking two balls together at a time, but the big points come from forming large groups and chaining clusters. This is where the game really shines, and managing to pull off a trick shot by bouncing around the sides of the table is immensely satisfying. Everything feels spot-on, especially the incredibly accurate controls, and regardless of whether you want to lightly tap a ball forwards or navigate tight corridors with power, the outstanding physics never let you down. While the premise could seem repetitive, I like that the developers introduced new mechanics in later levels to keep things fresh (e.g. Stump balls that can't be hit directly, and Struts that hold two different coloured balls together), as they help to challenge your mental agility in creative and engaging ways. 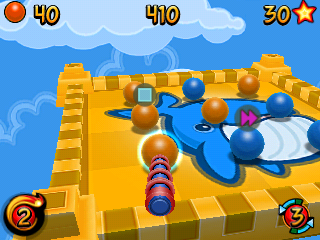 The graphics are bright and colourful, and although there is a tiny bit of slowdown when too many balls are on screen, it doesn't affect the gameplay to any meaningful degree. Sticky Balls is a top-class puzzler due to its addictive premise, superb execution, interesting gameplay mechanics and tight controls. It's easily one of the standout titles on the Gizmondo (as well as being ideally suited to a handheld), and is the kind of game where hours can pass in what seems like minutes! Random trivia: An upgraded version for the Sony PSP was in development, but was ultimately cancelled.